Click the above blue links to go directly to the cruise lines' websites to book or for rates, schedules, and more. are exceptional and worthy of your consideration. They attract an intelligent, educated, affluent, world-traveled clientele. All three also have first-rate food, spacious cabins and public spaces, well-appointed furnishings, and the Galapagos National Park's best naturalists. The Celebrity Xpedition guests are sophisticated, as are the other two luxury ships. But Xpedition guests are more likely to be laid back and friendlier. This is important because you will be socializing with your fellow passengers all day – at meals, on excursions, and for drinks at the bar and on the deck. And enjoying their company and making new friends is one of the pleasures of cruising. The Xpedition has spiffier, more comfortable furnishings - and more spacious cabins and public areas. 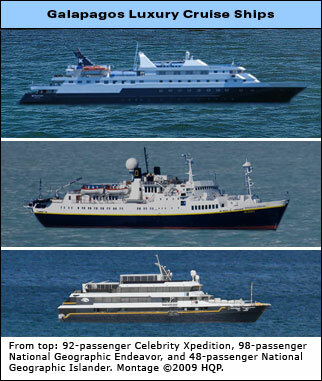 However, the Celebrity Expedition (and the other two ships featured above) is not perfect. No cruise ship could be. For example, a waiter forgot to place napkins on a table he reset. He did not promptly remedy the problem, even after a new party sat down at the table and pointed out the omission. But, overall, the Xpedition's shortcomings were few and far between. Click Celebrity Xpedition to read my ten-page description of this ship.